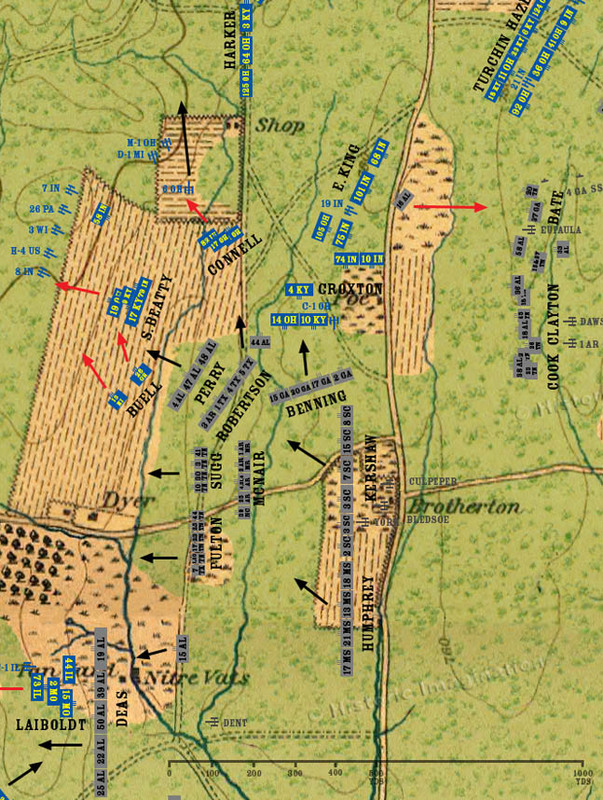 In Poe Field, the 16th Alabama finally relinquishes its foothold on the Lafayette Road and retreats back into the woods east of the field. The brigades of Connell, Samuel Beatty, and Buell are in full retreat across the expansive fields of the Dyer farm. Hood and Johnson’s Divisions are right behind them. On a low ridge to the west of the field five batteries of Union artillery have deployed and are trying to form a nucleus around which to rally the infantry. Croxton manages to shift his brigade facing south just before Benning begins his attack.